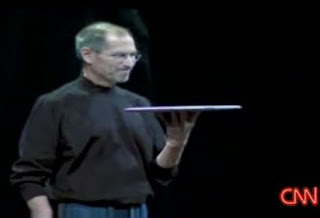 The World's thinnest notebook "Apple MacBook Air "
Few days ago, Apple Inc. Chief Executive Steve Jobs unveiled his latest Macbook series notebook called 'Apple Macbook Air'. Never showed much interest on Apple products other than Apple iPhone, this Apple Mackbook Air is even more astonishingly thinnest notebook I've every seen till date. 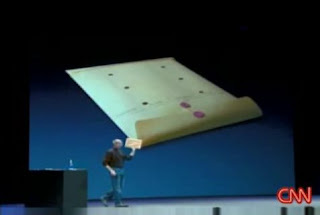 Steve Jobs announced that Apple Macbook Air would even fit inside a normal Envelope and when he said/showed that, It was unbelievable. It was extremely thin and when measured it's almost somewhere between 0.16 - 0.76 inch. It's not even an inch. According to him, other so-called thinnest notebooks have compromised on display(low display screen),keyboard(resulting miniature keyboard),processing power(low processing speed), and so to achieve their kind of thinness on their notebooks. 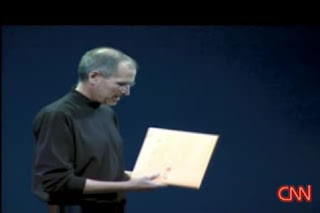 But, his Apple Macbook Air delivers all latest features with no compromise on anything. And, he announced it's price tagged at $1800. And this 'Big thing in Small package' will be available in market within 2 weeks from the date of his announcement. Which is now 8-9 more days to go. I wish I can finally afford one.